There are Lots of Quality Mobile Homes for Sale at Bear Creek in Central FL – Right on the Atlantic Coast! The homes we offer line wooded roadways in the gorgeous natural foliage of Ormond Beach in Central FL. Within our community, you will find three clubhouses, each with its own heated pool and spa. 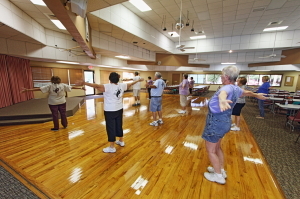 We also have tennis, pickleball, shuffleboard, bocce ball, and horseshoe courts, a billiards table, ping pong tables, a fully equipped fitness center, and other facilities that will cater to your active retirement lifestyle. With scheduled activities each day, a dance floor, and other events that are held regularly, you’ll never be at a loss for things to do. Plus, once you leave the secure gates of our community, you’ll find even more to keep you busy. Within minutes you can enjoy the white-sand beaches that line the Atlantic Coast and the many attractions of the Daytona Beach area. Our residents also enjoy being close to the Kennedy Space Center and the many theme parks of the Orlando area, both of which are an easy day trip from Bear Creek. For more information on our mobile homes for sale and the community life Bear Creek offers in Central Florida, contact one of our friendly Lifestyle Consultants today.